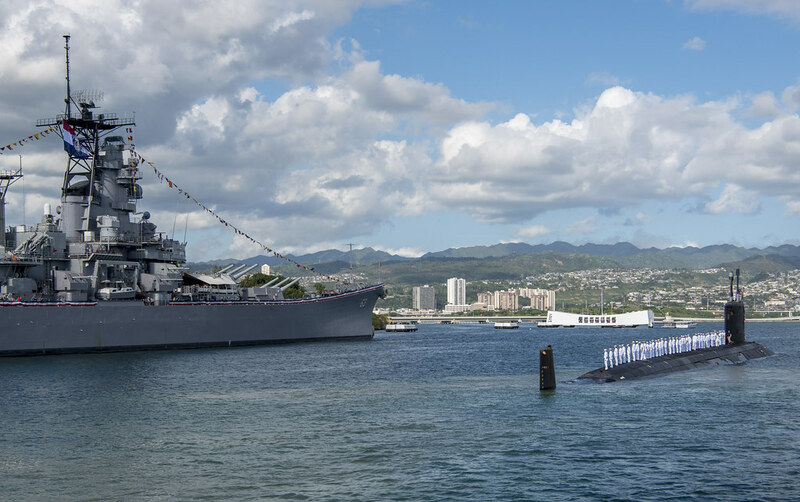 PEARL HARBOR, Hawaii - The Pearl Harbor submarine community welcomed the crew of 160 Sailors and officers, along with their families, of the Virginia-class fast-attack submarine USS Missouri (SSN 780) to Pearl Harbor following a successful homeport change from Groton, Conn., Jan. 26. Missouri is now assigned to Submarine Squadron 1, and is the sixth Virginia-class submarine stationed at Joint Base Pearl Harbor-Hickam. Missouri was commissioned and christened by the ship’s sponsor, Becky Gates, wife of former Secretary of Defense Robert Gates, during a ceremony at General Dynamics Electric Boat in Groton, Connecticut, Dec. 5, 2009. Missouri is the fifth Navy ship to be named in honor of the state of Missouri. The last USS Missouri, the legendary battleship, saw action in World War II, the Korean War and the Persian Gulf War, and the battleship was also the site where Fleet Adm. Chester Nimitz, Gen. Douglas MacArthur and many other U.S. and Allied officers accepted the unconditional surrender of the Japanese at the end of World War II. Missouri’s senior enlisted Sailor said how important support from the people in Hawaii was for a smooth transition from Groton. Howell also expressed his excitement to have finally arrived after the long journey from Connecticut. Howell said the crew is excited to experience a new homeport as well as a new culture. The 7,800-ton Missouri is 377-feet long, has a 34-foot beam, and capable of diving depths greater than 800 feet and operate at speeds in excess of 25 knots submerged. Missouri is designed with a nuclear reactor plant that will not require refueling during the planned life of the ship - reducing lifecycle costs while increasing underway time.